Every day when I’m out doing estimates I am shocked at the number of projects that are failing because minor structural issues were not done correctly the first time around. Some of these are done by Homeowners over the years to save on costs, which is somewhat understandable. 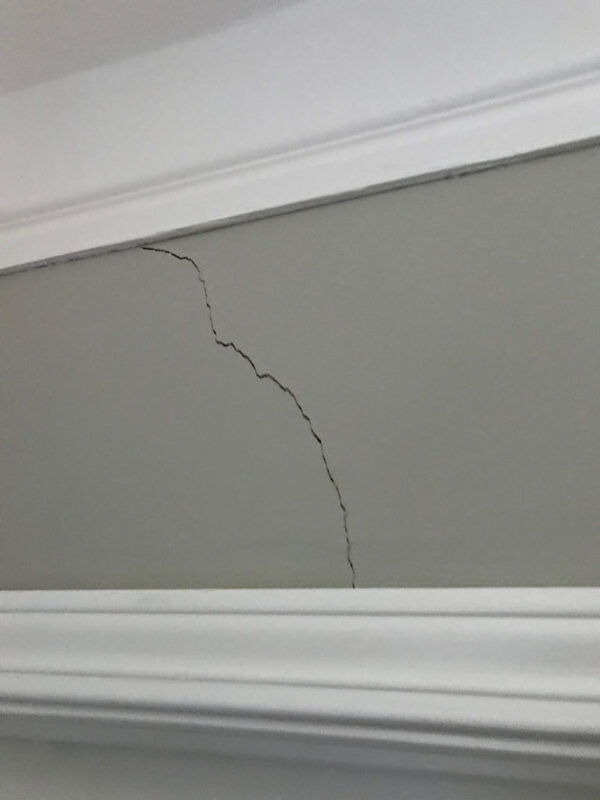 But something done blatantly wrong by another licensed Contractor is an even more disturbing, and all-too-familiar trend I’ve seen in the structural repair business many times in recent years. I try to stay out of doing bids when houses are being bought and sold. I find the environment does not lend itself to finding the best solution to structural issues, since there is often a conflict of interest between the Seller (and their agent, Contractors, and “experts”)–who want the best sales price for their home and may want to downplay any structural or drainage issues, and the Buyer. The Buyer tends to be more interested in the real problems, but also wants to negotiate the price down and may or may not intend to do any of the work. So the upshot of this is folks call me years later when they have a new or developing problem, and all they know is what information or work was given to them at the time of the sale. If they are lucky they have good intel and have a reasonable idea of what the issues are. But sometimes they only have information from the seller (or work done by them), which they are relying on to be accurate. The Owner had been in his new place about 5 years, and was beginning to see cracks develop inside, which is often an indicator of trouble below (in the crawlspace). The most obvious thing that I noticed right away was that they failed to remove any of the dirt from under the house when they did their excavations (to save money). 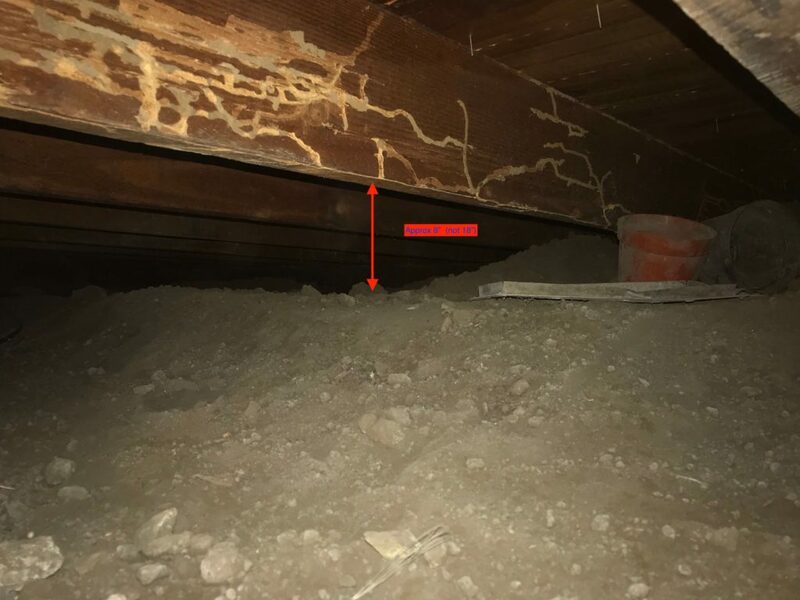 Not only did this make it impossible to get around under there to do future work, but it also decreased the ventilation down to a minimum, and given that there was evidence of prior termites (scraped down termite tubes on the floor joists). The building code requires 18” of underfloor clearance, and there was only 6”-8” in many places. All of this dirt would need to come out to fix the structural issues! At first I was scratching my head as to how this had gotten past the building inspector. Then I realized that he probably saw everything only from the outside–the forms and rebar at the time of inspection, and never got a look underneath, (since no reasonable Contractor would leave the dirt under the house). Never rely on a Building Inspector, permit, or signed inspections to show that your job was done properly. Building inspectors are often in a hurry, may be relying on inaccurate plans, or Contractors may be trying to do things they don’t want the inspector to know or look at. It all boils down to the integrity of your Contractor and their workers. The biggest problem however, was that there was a basic misunderstanding, either intentionally or through ignorance, of the work that needed to be done. As you can see in the picture below, the floor framing runs front to back under this house. The floor joists are small (2×6) with long spans, making the three interior lateral foundations very important to the integrity of the house. Since they were highly inadequate (consisting of small damaged concrete piers and 4”x4”’ beams), and were either not addressed or in some cases compromised by the perimeter work, the house was settling at the interior, which was reflected by the growing number of cracks inside. 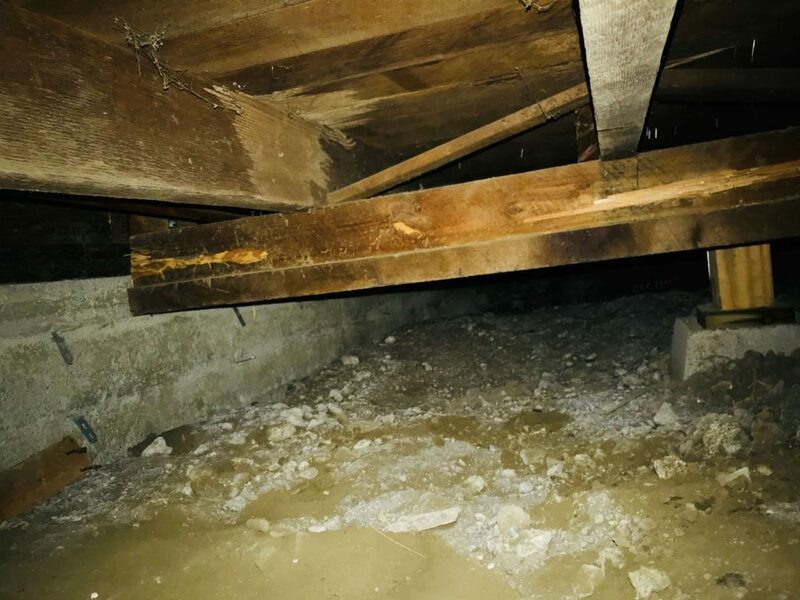 By leaving the dirt under the house, damaging some of the structural elements during the work, and failing to address the bigger foundation issues, the new owner was left with a big expensive mess. 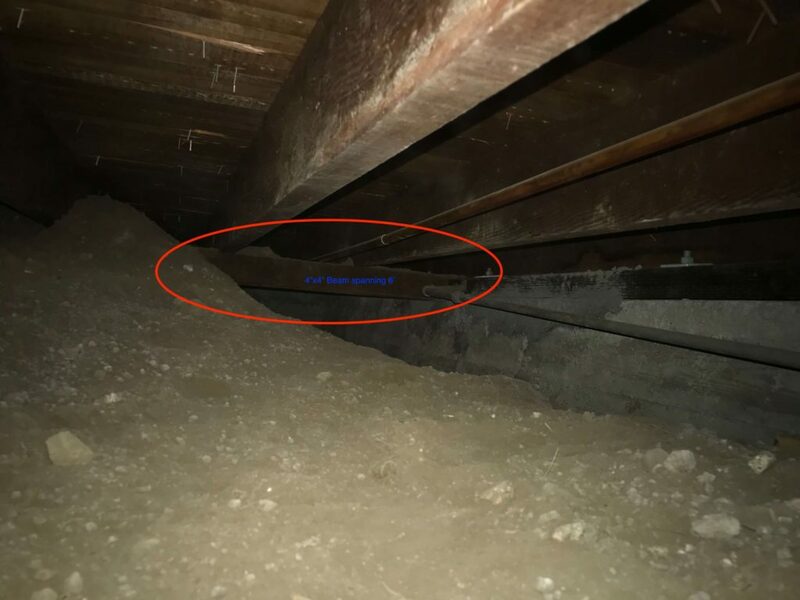 Removing the dirt from the tiny crawlspace will be a lot more costly than just removing it from the perimeter in the first place. Things were damaged that need to be repaired that were OK before the work. And it could have been even worse. Fortunately there are not drainage problems under the structure. If there were, the settlement would have been more dramatic. And the termites might have returned (invited by moisture and higher humidity) and caused any number of problems given their improved access to the building with the soil to wood contacts that were created. Hopefully the new homeowner has seen enough and will opt to do things right this time. Only time will tell. Long story short, this is just another example of why doing the wrong job can cost you a lot more in the long run. 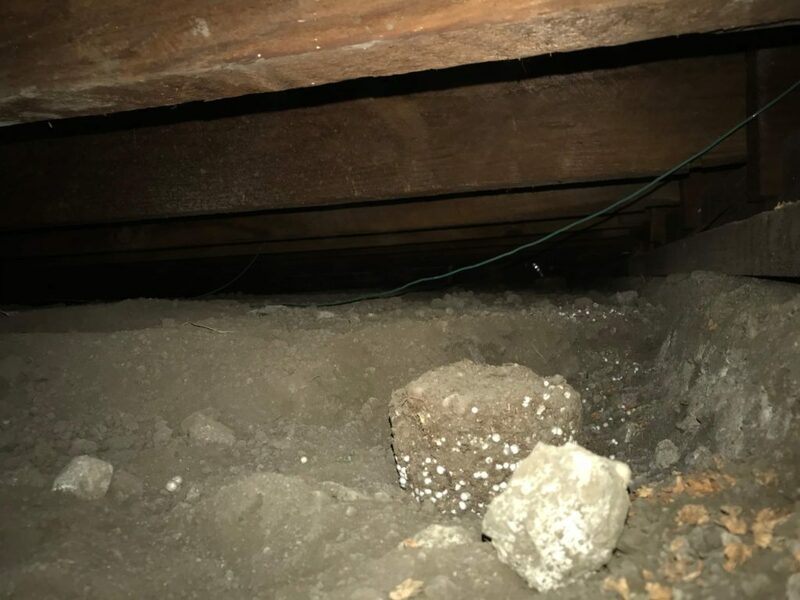 If you live in our service area of Oakland, Piedmont, Alameda, Berkeley, or Orinda and have a structural issue you want fixed the right way, feel free to reach out.